If you missed the unboxing preview of the shoe, you can check them out in this blog post. To recap, Nite Owl by Skechers is a shoe that glow in the dark. This is achieved by incorporating phosphors material that will radiates visible lights when energized. It all sounded rocket science when it is just really chemical properties of materials. So, as a quick recap you are talking about this shoe here. Because the Nite Owl presented to me was based on the GoRunRide2 platform, this review will be based on the functionality of the shoe as a legit running shoe than it being branded as a "gimmick"
1. Always do it late afternoon or evening when the feet has swelled to it's largest. 2. Always bring your own socks that you will wear with the shoe. Not just for hygiene reasons but also for that good fit. 3. If the shoe has removable insert, try it both with or without. If you use corrective insert, bring them along. In short, go prepared. 4. Tie the laces as you normally would. Once worn and secured, put a finger (index) behind the heel to see if it fits nicely without your toes (or longest small toes) hitting the front of the shoe. If it does, it's tight fit. If you can put in two fingers, it's too big. To be honest, I was more excited about the Glow property that how the shoe will feel the first time that I totally forgot how it was until I wore it again later for a proper run. I took note that the shoe was (as expected), cushioned. Here is my comparison of the 5 road running Skechers I've tried, in order of cushioned to least (>) cushioned. One of the major update on GoRunRide2 is the reduction in "height" in the middle portion by 2mm. May sound not a lot but that has actually reduced the "bump" feeling if you are a second time Skechers Performance owner. Despite trying the 6-previous Skechers and knowing the "bump", the GoRunRide2 were surprisingly...flat. But will it deliver what is promised in terms of "encouraging mid-foot strike"? Only one way to find out. Obviously, I've charged the shoe prior to the run and I've chosen to run like at 8pm that day. How else would I want to see if the shoe really did light up and perform? As lame as it may look or sound, I did had a few neighbours driving as slow as my 4:15 pace and obviously I had to also glance over to see if I am running into their lane. The two cars that slowed down was caught looking at the shoe. That was how much it actually glowed to capture their attention. It could be that they caught me at the darkest (tree covered stretch) and saw the shoe glowing from far. As expected, no issue with the shoes with socks and liner. The Nite Owl GoRunRide2 in black allows you to actually use your working socks without looking dorky ;-) One less item to wash, environmentally aware! How did it really felt? I've been running in the GoRun2 during training and has technically out-ran the GoBionic Ride (almost 400km) and this shoe came in at the right time as a replacement. One thing about these shoe is the Resalyte sole where it showed lasting performances. The Nite Owl GoRunRide2 meet the expectation as it provide good cushioning and bounces while letting me maintain the mid-foot strikes. Do bear in mind that the ability to strike and land midfoot requires you to re-learn your running technique. As Skechers rightly said, it "encourages" and not "make you". I've been sockless mostly in my runs. The only time i wear socks is for review purposes so I could give you folks a clear idea on how it will perform "traditionally". The other time I will wear a socks is when I know I will be using the shoe again later in the day - as the socks will help sock up sweat and keep the shoes drier. How did it really felt? I was looking out for potential pressure points that could give problem over a long run. However, as my weekday runs are mostly limited by time (30mins) and distance (at most 7.5km), and again, driven by late evening run because I want to see the shoe Glow. With exception that the shoe was still new and certain parts were a bit stiffer (small toe area, right foot), the Nite Owl felt as it should. The fitting were right on the dot (minimal adjustment on the laces) and the cushioning were good. I did had one blister when I took the shoe out for speedwork one evening. It could be bad lacing (too loose) or it could be a part near the last 4th toe (stitching) lending a blister forming. I will continue to monitor and report back if this is persistent when I wear this sockless. I am highly unlikely to go with this combo as if I do want to run in this combo, I would had just taken the GoRun2. Does that answer your curiosity? Yes, removing the liners and sockless made the shoe feel were GoRun2. It is flatter than GoRun2 without liners likely due to the reduction in mid-stack. Again, the Cushioned feel of the Nite Owl GoRunRide2, in my own opinion, is partly contributed by the thicker than usual liner. A comparison of the insole (top to bottom) GoBionicRide, GoRun2 and GoRunRide2. 1. The heel cup is soft though it looked hard. Seems to be a common theme except on GoMeb. 2. The spacing of the pods or the GoImpulse is still potentially allowing small stones to get locked in between. This is because of the "deeper" mid section cut-out. In the short runs I had, there were none, but not discounting any in the future as the runs takes me out of my usual route. Not a big issue as I have a habit of inspecting the sole after each run for both extreme wear and tear and also to clear any mucks or sand (as I keep my shoes inside my house). Stones/pebbles may get caught at the deeper lugs surrounding the GoRun logo (left image) compared to the part on the right belonging to GoRun2. Note the wear and tear on GR2 after almost 250km. Still looked good! All in with liner : 260grams each. There you have it, the liner is 20grams per side and that is not too much if you ask me. On a normal run, you will hardly felt the weight. Not so much of an issue if you ask me from a competitive amateur point of view. I took the Nite Owl for an early morning race that is the Adidas King Of The Road at New Pantai Expressway (NPE). 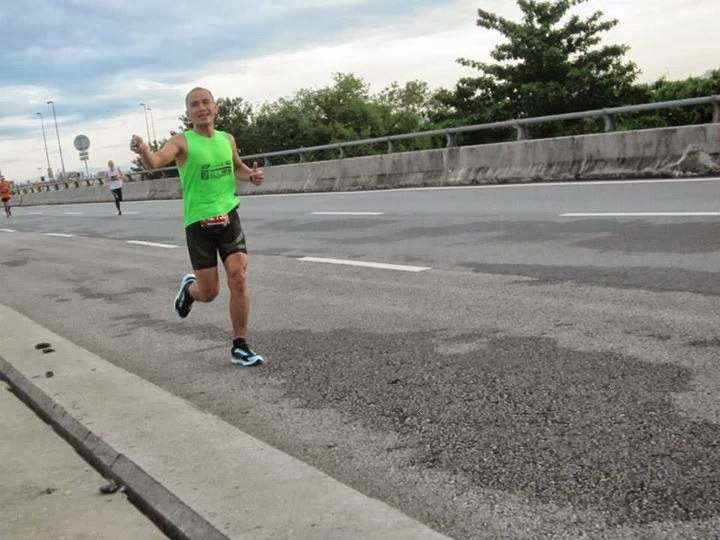 The run is a 16.8km distance over undulating highway road and smooth pavement was the route of the day. The shoe performed as it should in this long distance race with the cushioning absorbing every single strike the feet landed. However, this could just be myself having very much used to running on mid-foot strike and bio-mechanic able to take the pounding. Being lighter than I was 2.5 years ago does help with the impact-management (if there are such thing). I ran the King Of The Road using Nite Owl in 1:15. An-ok timing considering I did not push in the run with it staying within my LTHR of 164bpm. Having asked this, so, is this GoRunRide2 in Nite Owl Glow in the dark suitable? For the record, this Nite Owl was raced with socks for KOTR 16.8km race. The shoe cushioning were most felt on the long run as it absorb every steps. I can feel my feet sink on impact and rightly so since this shoe is meant to be cushioned ride. So, for those of you on the heavier side and transitioning from a full cushioned shoe to a minimalist (4mm drop or less), you could have found a good potential replacement. If your previous shoe has made you felt like running on heels, due to the thicker out sole usually found on cushioned shoes and you felt that your ankle may give way due to the height (rolling over/falling by the side), this 4mm Nite Owl will provide you good ground feel and you will almost felt this is not a cushioning shoe you used to. I don't blame you as this is not your usual cushioning shoe. I often get questions if a shoe i review is good for a longer run. I believe many shoes are suitable but some are built with more purpose than other. For example, motion control shoes that are more structured to help people that over or under pronate. Support shoes that are meant for people with low arch or high-arch. Neutral shoe for everything in between. If you been following my blog since 2007 when I first gotten my first pair of shoe for review, you will actually see that I went from full control/cushioning to minimalist now. Also take note that I went from a heavier sub 90kg frame to a lighter sub-70kg weight. My running style or gait, we some technical runners would like to call them, has changed from heel striking to mid-foot/forefoot strike. Many things has changed and I've been more informed of my choices by the mistakes I've done. So, how does that help to answer this pertinent question on "is this shoe suitable for a long run?" While this shoe was given to me under the 2ndSkin collaboration, I am obliged to report back to Skechers on the performance for them to consolidate and feedback to their HQ in US. So far, a lot of my comments and feedback, including other users, has been shared with them and I've seen improvement in each and every edition that supersede the older model. I hope this will help answer some questions you may have. But as usual, do ask anyway; I am here to share what I know so you won't make the same mistakes I did! Note: This pair of Skechers GoRunRide2 Nite Owl is sponsored by Skechers Malaysia via collaboration with 2ndSkin Asia Athletes program. Thank you Skechers Malaysia and 2ndSkin! This pair of Nite Owl is expected to retail for RM399 (Women) and RM429(Men) and WILL be available at all Skechers store end of October or early November. At point of posting, Skechers global is experimenting with the style and color as well. So, expect other glowing colors! Hi can the go run ride 2 be used in conjunction with the go run 2 as a long distance trainer ie >21km? And go run 2 be used as a shoe for 10-15km runs?